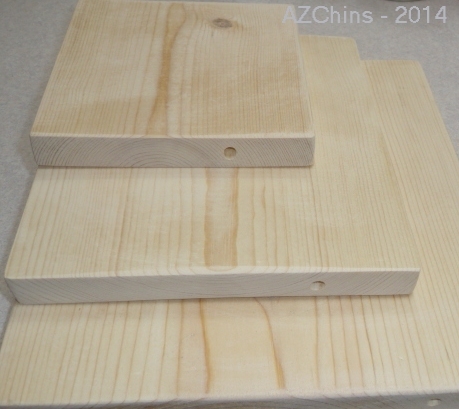 Description: Pine corner shelves are versaltile, easy to add shelving for almost any chin cage. They fit in the corners of nearly any cage with two fasteners that sit flush with the cage sides. Two fasteners come with each shelf, an adjustable wrench or socket wrench will be necessary to install them. They come in 6", 8" and 10" squares. The wood used is completely chin safe. Some chins enjoy destroying them, keep this in mind when deciding what size to buy. Please make sure to take measurements to see if the shelves will fit in your cage, especially if you want the larger shelves.